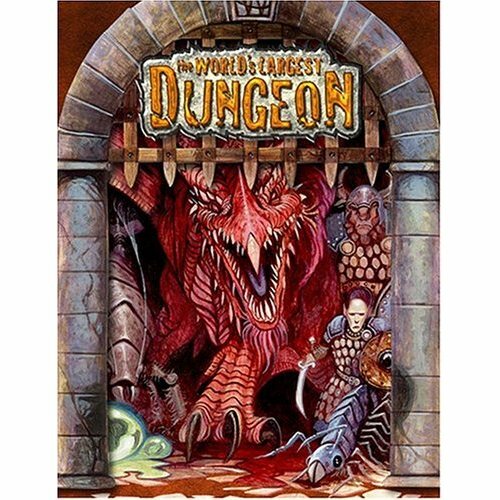 World’s Largest Dungeon features an epic dungeon-crawling campaign written for the D&D 3rd edition, designed to take characters from level 1 through 20. The book is hardbound and is very sturdy. It is bound in such a way that it will lay flat pretty much wherever you open it to. The layout is two column with pretty small text (I’d venture a guess and say around 6 – 8 pt.). Illustrations are grayscale and sparse. That is to say, you get an AWFUL lot of content in this book. The maps are very nice, color and are folded in such a way that each quarter of the map is 8-1/2″ x 11″; perfect for scanning or copying. The introduction spends a few columns going over the real-world whys and wherefores of the WLD. It then launches into a game-related backstory for the WLD. The backstory is important if you want to use it as a cohesive whole. The designers include notes at the beginning on alternate ways of introducing the dungeon. It gives well over 20 reasons/hooks. After all the introductory stuff is out of the way, a mere 12 pages, we get into descriptions of things that aren’t on the map. These include empty rooms for when the DM doesn’t want to use what’s in the region, or when they want an extra room to customize the experience. There are also some above ground encounters describe that lead to the first room of Region A. The room descriptions is where the WLD really shines. They include grey-box text for the DM to read aloud, information on encounter conditions, tactics (including stat blocks for every creature/NPC in the room), and scaling info for DMs who want to make the encounter more or less difficult. The storylines of the 16 regions are all interconnected, but it is done so in such a way that you can take one region out and run it on its own. I think this is a very cool way to handle an adventure this large. DMs won’t have to run the whole thing straight through if their campaign won’t support such an undertaking; they can pick and choose parts of it. In addition to areas controlled by monsters, there are also “safe” rooms buit in where the PCs can recuperate in relative safety. All of these are in the dungeon in a way that fits in with the logic of the location. The 16 maps all connect and can be laid out and one giant, wall-sized map. The “outside” of the dungeon has passageways that lead off to areas not detailed, allowing creative DMs room to customize their WLD experience, or allowing them ways to get higher-level characters into regions built for more powerful characters, thus avoiding the regions for lower level characters (e.g. Region A, designed for levels 1 – 3). That’s pretty good foresight on the part of the designers. The WLD is a huge undertaking for any group. I did notice a few errors, particularly in some room descriptions where they’ve been written as though the PCs enter from one direction, but there are multiple entrances to the room. But, these errors don’t detract much from the enjoyment factor of this product, unless you’re not the type to read ahead. As I’ve mentioned, it’s mind-bogglingly huge, and I can only imagine the amount of effort editing this monster was. I’ve seen more errors in TSR products (during the lean years of the mid-90’s) that are half the size of but one region. The biggest pitfall with this product is that it really isn’t designed to work with an “anything goes” type of campaign. Druids are of limited use. Wizards really have no facilities in which to research new spells (if you go by the Rules As Written or RAW). In my experience running a nearly 18-month campaign of it, unless you limit your players to using ONLY the core classes & races from the 3rd edition Player’s Handbook (i.e. Fighter, Ranger, Paladin, Rogue, Bard, Sorcerer, Priest and reluctantly Druids and Wizards), they will find most fights too easy. I made the mistake of saying “Ok, anything goes in this campaign,” and since 3.5 was well underway when this came out, the group was too overpowered for most of the encounters. Still, there are a lot of good ideas in this book, and over the years, I’ve noticed that if you need a good dungeon section for whatever reason, you can just yank out a section of this book. Or, if you’re feeling really lazy, you can even integrate it into a Ptolus campaign as The Dungeon (i.e. Ghul’s Labyrinth).